Oregon Democratic Gov. 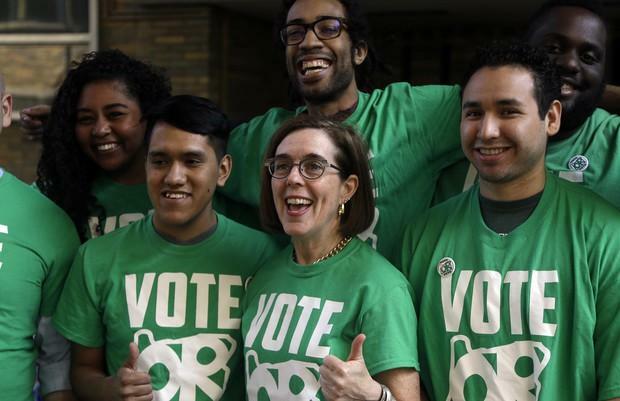 Kate Brown, middle, poses for photos with student volunteers during a "get out the vote" gathering at Portland State University on Oregon's primary election day Tuesday, May 15, 2018, in Portland, Oregon. Brown's campaign is coordinating with a union-funded group called Defending Oregon’s Values to run ads against her Republican challenger, Oregon state Rep. Knute Buehler. Television viewers are seeing new attack ads in the race for Oregon governor – but it’s far from clear to the casual watcher who is paying for them. A union-funded group called Defend Oregon’s Values has launched a new TV ad criticizing Republican nominee Knute Buehler, a state legislator from Bend, for his record on health care. It turns out that the group is coordinating with the campaign of Gov. Kate Brown, a Democrat. Meanwhile, the business-oriented group Priority Oregon has two new ads criticizing Brown for not reducing the rapidly rising costs of Oregon's public pension system.